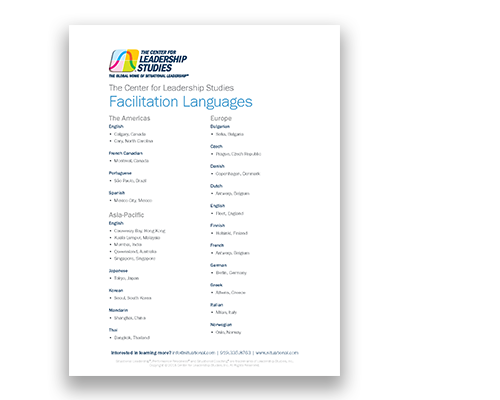 The Center for Leadership Studies services customers both domestically and internationally through an extensive network of over 200 learning professionals and facilitators in more than 38 countries. Members of our global network understand the nuances present in each distinct cultural environment, allowing for the implementation of high-quality training programs in localized languages. Our network consists of learning professional and Certified Trainers who are passionate about developing leaders within your organization. With a united desire to share the Situational Leadership® Model around the globe, our team has the ability to facilitate the model and additional course offerings in over 22 languages. We provide clients across the globe with course offerings translated in over 25 languages. 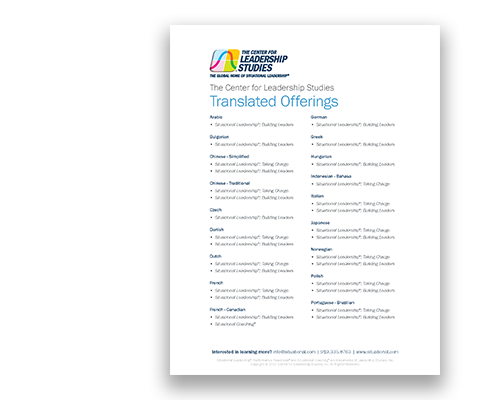 As the global home of Situational Leadership®, we pride ourselves in delivering quality content to organizations who wish to develop their leaders with various translation needs.